Fee's Little Craft Studio: Are you being productive ?? As usual I have lot's of projects on my to do list but as I am time poor at the moment due to work commitments I am only able to manage hand stitching at the moment - Just a little each evening. This is a project I have wanted to do for some time it is a sewing caddy designed by Bronwyn Hayes - All of the stitching is now completed but it will have to sit in the UFO box for a little bit longer. Our first month of frugal living is now over - How did you go? I am really pleased with our household's efforts - We have managed to pay off some debt, reduce our household waste and we have not bought any non-essential items - I have not even purchased a single scrap of fabric. One of the ways we have saved money and reduced our household waste is by using a soda stream which we purchased for the girls as a christmas gift. After the initial outlay (around $50 on special) each Litre of Carbonated Soft Drink costs just 80c and totally reduces household waste. The Gas bottle is returned once it is empty and exchanged for a full one for around $11.50. 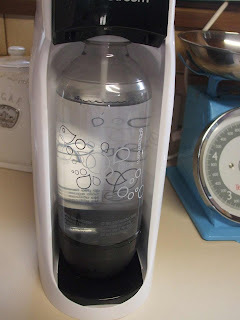 You simply fill the bottle with tap water and press the button 3 times to carbonate the water. Then just add a cap full of flavour. There is a huge range available. 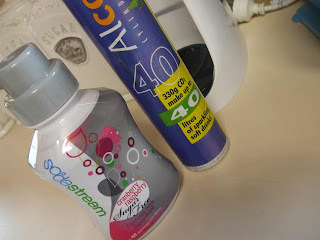 If you want more information check out the soda stream web site. If you are looking for another project to add to yourt list check this out. Today is the launch of the February Freebie on the Among The Gum Trees Web Site from the lovely Joy over at Joypatch. It is a remote arm chair caddy and it is just lovely and very practical. 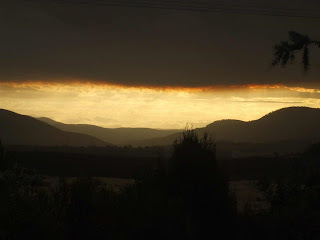 We have had quite a warm summer here in Tasmania but along with the warmer weather also comes the fire season. Tasmania has had a few serious fires this season. Even though this photo is very pretty sadly it is caused by smoke from a bush fire deliberately lit in the Derwent Valley. We can see it from our front door. It has caused an eerie glow and the sky to be partly shaded. I hope and pray that the firies get it under control really soon and that no lives are lost. I really love that stitching. What do you use to colour in the flowers though? Love your stitching! It is beautiful. Never heard of the soda machine before but what a great idea! What a pretty stitchery, Fiona! The soda machine is a great idea. I've never seen one. I'm sorry to hear about the fires - I'll be praying everyone stays safe. Your stitching looks really lovely! Hope the fires have eased. Wasn't the smoke eeriem, bought me the shivers. Stitchery looks fab! 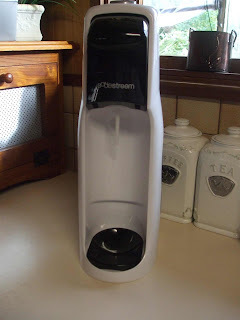 My kids had a soda stream 30 years ago so nothing new ...things always come around they say if you wait long enough. Good on you for your budgeting. Ooh Fee Fee, I have one of those soda stream thingies here somewhere, I must hunt it out!!! Love your stitchy, the colouring in makes it so pretty! Those are fabulous piccies ..... I do hope the fire was under control before too much damage was done though. I can't believe there are such irresponsible people in the world. Grrr!! Well done for January! I have followed suit and am thrilled with the budget savings being made, as well as no fabric purchases apart from a layer cake from you. LOL! 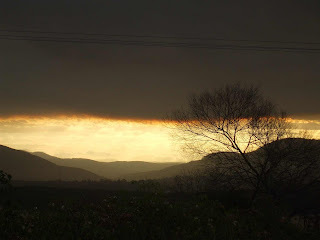 Fires do bring our hearts a shudder as they come close - we lived in Canberra during the bushfires of 2003. Black sky in the middle of the day, the stench of burning all around...it was something I'll never forget. Previously we'd been caught in two bushfires in NSW, the first was the night Mark asked me to marry him. Memories. 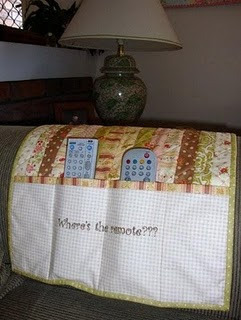 I just finished my 'where's the remote???' pattern by Joy. Isn't it the cutest pattern. I saw it and had to make one. 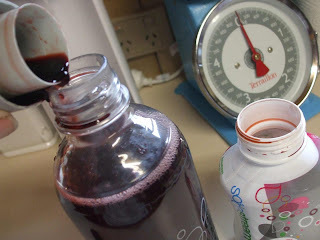 We found that normal cordial was more economical and worked just as well with the soda stream rather than their flavors. We use ours for soda water which we put slices of lemon in. 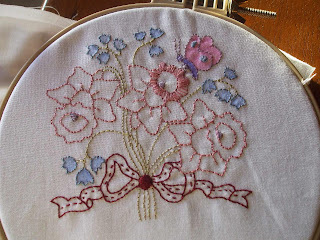 Your stitchery project is so pretty - nice choice of colors and craftsmanship. I had not heard of a soda stream. Might have to check into getting one of those for the grandkids.